This page contains the best data management practices at PO.DAAC. The content covers how PO.DAAC generally manages its data from acceptance, ingest, distribution, and retirement, along with the various documents and templates that are associated to those various stages. It also includes the recommended file formats (NetCDF, HDF) and metadata conventions (CF, ISO 19115, ACDD) for our data providers. Every dataset that enters the PO.DAAC for archival and/or distribution must go through an acceptance process. The primary driver of this process is the Dataset Gap Analysis and Prioritization (DGAP). The DGAP provides the means for identification (See Figure 1 under Dataset Lifecycle) of individual datasets corresponding to a particular geophysical parameter, which are not yet being archived or distributed by the PO.DAAC. After identification, these datasets become ranked and prioritized according to their corresponding geophysical parameter to determine. The datasets of highest priority and ranking are then given the “green light” for the final phase of acceptance. In the final phase of acceptance, a system impact assessment is performed to assess the associated costs to the PO.DAAC to ingest the new datasets, and when approved by the Systems Engineer a Submission Agreement (a.k.a. Memorandum of Understanding) is signed between the dataset provider and the PO.DAAC manager. Once accepted, the new dataset is now ready to become integrated into the PO.DAAC. PO.DAAC’s Dataset Lifecycle provides us with a set of guidelines to govern the end-to-end archive and distribution of our data holdings. This framework provides a formalized process and requirements checklist useful for planning and managing datasets through the various phases of the Dataset Lifecycle. Its purpose is to ensure we meet the minimum standards and expectations for Quality, Quantity, Continuity, and Latency (QQCL), which are applied consistently for all archived datasets. Figure 1 depicts the flow of the dataset lifecycle as it transitions through various phases, beginning with identification. Figure 1: A simple flow diagram of the Dataset Lifecycle through all phases. Solid red lines indicate chronological flow for all datasets while red dashed lines indicate conditions in which a dataset is either retired or replaced with a newer version. To the right of the flow diagram is a corresponding chronologically ordered table indicating the key deliverables throughout each Lifecycle phase. Check marks indicate which of the deliverables are required before the corresponding phase to the left is considered complete. DGAP = Dataset Gap Analysis and Prioritization. IS = Integrated Schedule. SIA = System Impact Assessment. IPA = Inter-Project Agreement. ICD = Interface Control Document. DMP = Data Management Plan. ORR = Operational Readiness Review. DOI = Digital Object Identifier. UG = User Guide. RP = Retirement Plan. 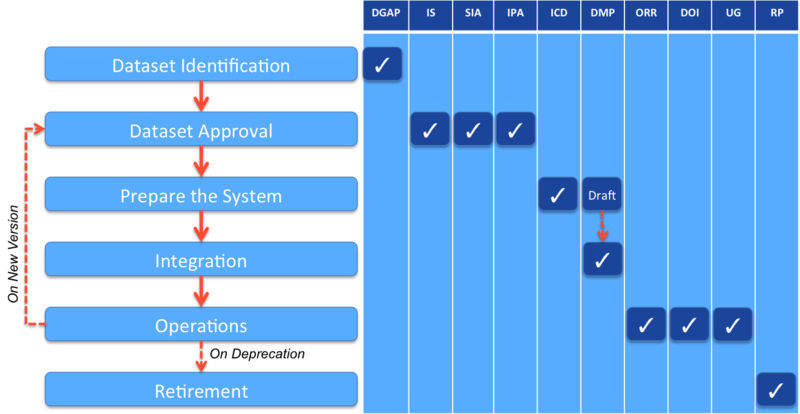 The Dataset Identification and Dataset Approval stages of the Dataset Lifecycle correspond directly with the information presented in the previous section on Dataset Acceptance. Dataset Integration begins with a complete harvesting and ingestion of metadata (both granule and collection-level) and concludes with full integration to all compatible access protocols (e.g., OPeNDAP, THREDDS), tools (e.g., HiTIDE, LAS, SOTO), and services (e.g., Web Portal, Web Services, EMS, GCMD, ECHO/REVERB). Once integrated, a review is conducted along with a formalized checklist to ensure all requirements and expectations are met, and the dataset becomes Fully Operational pending a successful review. Datasets that are Fully Operational come with the applicable levels of service to accommodate a service-oriented data distribution including user support, guide documentation, and accompanying read software. When new versions of an existing dataset become available, the Dataset Lifecycle process is repeated iteratively at the Dataset Approval stage. Dataset retirement is initiated on datasets which are deprecated by newer versions and removed from public visibility with reduced levels of service as determined by the dataset provider; aside from version deprecation, Dataset retirement may also result from a situation in which data may be quarantined due to a proliferation of erroneous data which contaminates the complete data record. PO.DAAC recommends that data providers implement their products using HDF5 or NetCDF4 file formats. These file formats contain versatile data models that supports a self describing, machine independent data format thus promoting interoperability, tool use and sharing of scientific data. Both data models have extensive applications in distributing NASA satellite data as well as used in many international satellite missions. Applications have included Level 2, 3 and 4 satellite data as well as in situ data. In addition to advancing and providing recommendations on scientific file format standards as discussed above, PO.DAAC adopts, advocates for, and provides guidance on the usage of appropriate metadata standards for geospatial data. Metadata provide important descriptive information on data and file elements. Conformity to community developed and approved metadata standards facilitates the consistent and valid semantic interpretation of information and data critical for ensuring both efficient and automated data discovery and interoperability with tools and services across distributed and heterogeneous earth science data systems. While several established and emerging geospatial metadata frameworks exist (eg. FGDC, ISO19115), two metadata standards frameworks in particular are important in the remote sensing context, the “Attribute Conventions for Data Discovery” (ACDD) and the “Climate Forecast” (CF) convention. Implementation of ACDD and CF metadata by data providers is strongly encouraged, and the PO.DAAC works closely with providers to advise on metadata and file format aspects as part of our data archival acceptance policies. Here we provide an overview of these metadata frameworks with useful pointers to additional information. Data providers with further specific metadata questions who are considering data archival submissions should contact the PO.DAAC (email: podaac@podaac.jpl.nasa.gov). The Climate Forecast (CF) metadata convention, spearheaded by the Program for Model Diagnosis & Intercomparison (PCMDI) at Lawrence Livermore National Laboratory, provides a standards specification for both global file header and variable level file metadata attributes aimed at facilitating both discovery and interoperability of datasets used in climate science modeling, including remote sensing data. This includes standards for variable dimensioning, and variables holding both observational measurement data and georeference and time reference data linked to these plus associated auxiliary variables. The CF convention consists of a series of well-defined attributes, auxiliary variables, naming and value assignment conventions that provide a standard characterization of the contents of data files. This facilitates robust semantic interpretation and usage of data. Further information on CF metadata is available at http://cfconventions.org/. The current version of the CF standard is 1.6, and complete documentation of this latest specification is available at http://cfconventions.org/latest.html. The tables below summarize key global metadata attributes and variable level attributes associated with the CF convention recommended for usage with datasets slated for PO.DAAC archival. The ACDD convention, developed initially by UNIDATA as a complement to its netCDF self-describing scientific file format and now adopted by the ESIP Federation, provides a standards specification for global metadata attributes associated with the “header” portion of data files aimed at facilitating efficient and automated discovery of geospatial datasets. It consists of a series of standard attributes and naming conventions that provide a well-rounded and synoptic characterization of the scope and contents of data files, including for example the spatio-temporal extent of the file data, the type and processing level of the data, keyword descriptors, and details on the dataset provider. Complete documentation on ACDD metadata is available at http://wiki.esipfed.org/index.php/Category:Attribute_Conventions_Dataset_Discovery, and a listing of key ACDD global metadata and variable attributes recommended by the PO.DAAC minimally for inclusion in data files is given in the tables below. Table 1. Key ACDD/CF Global Metadata Attributes defined and illustrated. Table 2. ACDD/CF Measurement /Auxiliary/Quality Variable Attributes. Table 3. Georeferencing Coordinate Variable Attributes. One can see that many attributes are shared across Measurement and Georeferencing variables. Table 4. Temporal Coordinate Variable Attributes. Here too many attributes are shared with Measurement and Georeferencing variables, but with a specialized usage specification of the 'units' attribute as shown below. the grid_mapping attribute and variables that describe the mapping projection between coordinate variables and the true latitude and longitude coordinates. Standard attribute structures for the representation of complex sampling geometries, from point data to time series to profiles to trajectories. Full descriptions of these capabilities and further information on the core attribute types summarized above are provided in the CF documentation available at http://cfconventions.org/. ISO 19115 is a type of metadata that facilitates machine readability. At PO.DAAC we have consolidated web services (http://podaac.jpl.nasa.gov/ws) that will convert metadata to make it ISO 19115 compliant.